Published in Rafu Shimpo, July 29, 1970, Japanese section. 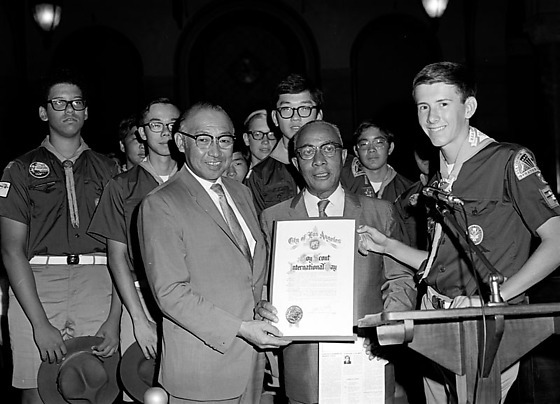 Los Angeles City Councilman Gilbert Lindsay presents "Boy Scout International Day" proclamation to Boy Scouts to be taken on their trip to Japan, Los Angeles, California, July 28, 1970. Includes older African American man dressed in suit and eyeglasses, and El Camino Boy Scouts of America chairman James Nakagawa, a Japanese man in eyeglasses and suit, holding proclamation in front of a group of multi-ethnic Boy Scouts beside a podium with microphone, and in front of wall. Typed on orignal envelope: Boy Scout -- Proclamation from City Counsel to Boy Scouts to Japan -- c/o James Nakagawa.